40.00 mm 18K 5N pink gold case set with 66 diamonds, 8.20 mm thick, transparent sapphire back, silver dial, Caliber 2450 Q3 automatic movement with hours, minutes, date in aperture, center seconds, approximately 40 hours of power reserve, dark brown alligator Mississippiensis strap, 18K 5N pink gold ardillon buckle. Water resistant to 30 meters. 38mm 18K white gold case, transparent sapphire crystal back, silvered curved opaline dial, self-winding 2455 movement with hours, minutes, seconds at 9 o'clock, date window, approximately 40 hours of power reserve, black Mississipiensis alligator strap with classic 18K white gold buckle. Water resistant to 30 meters. 38mm 18K white gold case, transparent sapphire glass back, silvered opaline dial with finely snailed counter and diamond hour markers, self-winding 2455 movement with hours, minutes, small second, calendar in aperture, approximately 40 hours of power reserve, Mississippi alligator strap with diamond-set buckle. Water resistant to 30 meters. 38mm 18K yellow gold case, transparent sapphire glass back, silvered opaline dial with finely snailed counter, self-winding 2455 movement with hours, minutes, small second, calendar in aperture, approximately 40 hours of power reserve, Mississippi alligator strap with diamond-set buckle. Water resistant to 30 meters. 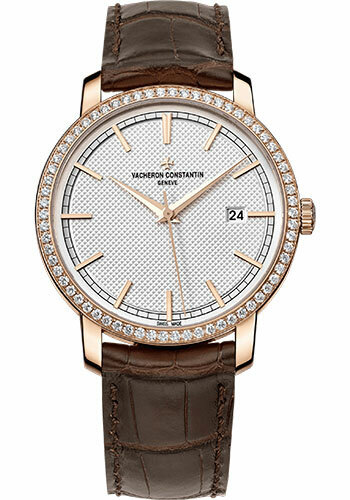 38mm 18K rose gold case, transparent sapphire crystal back, silvered curved opaline dial, self-winding 2455 movement with hours, minutes, seconds at 9 o'clock, date window, approximately 40 hours of power reserve, brown Mississipiensis alligator strap with classic 18K pink gold buckle. Water resistant to 30 meters. 38mm 18K 5N pink gold case, transparent sapphire glass back, silvered opaline dial with finely snailed counter and diamond hour markers, self-winding 2455 movement with hours, minutes, small second, calendar in aperture, approximately 40 hours of power reserve, Mississippi alligator strap with diamond-set buckle. Water resistant to 30 meters. 38.00 mm 18K 5N pink gold case, 8.02 mm thick, transparent sapphire back, 18K 3N yellow gold dial, Caliber 2455 automatic movement with hours, minutes, date in aperture, small seconds at 9 o'clock, approximately 40 hours of power reserve, dark brown alligator Mississippiensis strap, 18K 5N pink gold ardillon buckle. Water resistant to 30 meters.